There’s no doubt that the 1.9 update sparked quite the controversy. 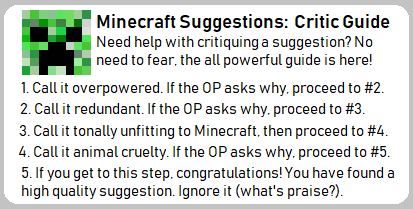 Mojang has already stated that combat will be redone again, so here is my proposal for how combat should be changed and improved upon. In this first part of the series, I’ll be focusing on swords, shields, and armor. Sword combat would be more exciting and a lot more intuitive if it were approached in a different way. Thus, I’d like not to bring back 1.8 sword combat, but to introduce a simpler system inspired by the Legacy Console Edition combat. Essentially, you’d be able to click as fast as you want, and it wouldn’t change how much damage is dealt, but you could only attack five times per second. More specifically, if you click again within a 1/5 second of attacking, you will not attack. Sword blocking was sadly removed in the 1.9 update, but it clearly had unused potential. I’d like to reintroduce it, but remove the latency between right-clicking and the sword blocking. Additionally, sword blocks should block all sword-induced melee damage while facing the attacker, but the sword should cease to block after the defensive player is attacked. When two players attack each other at almost the same time (1/10 of a second maybe? ), neither of the players should take damage, and a CLINK sound should play. The advantage to blocking with right-click as opposed to just trying to hit at the same time as the opponent is that, while you’d have to wait 1/5 of a second to attack again after blocking via attacking, you would be able to instantly attack after blocking with right-click. Since you would now not necessarily want to attack at the same time as the player, this would remove a lot of the constant blows and add more strategy to sword fighting. The main issue with shields is that they don't require any skill or thought to use; simply hold right click and you're invincible. To encourage more movement in combat, shields should have a much narrower area of effect, and players blocking with a shield would experience much lower sensitivity. However, the time it'd take to raise the shield would be greatly reduced. These changes to the shield would result in the best strategy being to use quick, short blocks as opposed to shield camping. Additionally, as suggested by StickyPistonPig, the person attacking should not take knockback. With the new “weight” attribute of armor, some armor provides more knock back resistance and speed reduction than others. For example, diamond and gold armor are the heaviest, and thus take little to no knockback. However, players wearing these armor sets will also experience reduced movement speed. Leather armor does not reduce knockback or movement speed. With the other armor sets, it’s chainmail < iron < diamond / gold. Gold armor might be more useful since it now has knockback resistance, but it’s still obsolete once you have diamond armor. To give gold armor a new use, it should have special resistance to magic attacks (potions & guardian lasers). With these changes to armor, there would be a reason to mix-and-match armor types. Additionally, leather, gold, and chainmail armor, which were previously useless, would now have a use. It's rare that I wholeheartedly agree with a suggestion. In truth, very few of these ideas are yours. They have all been suggested before. But you were able to take all of them, and simplify + unite them into a vanilla friendly bundle. Just a little while ago, I spoke in the discord about how I didn't really care about combat mechanics. Well, just yesterday I had my first proper PVP experience in about a year and a half (I mainly stick to creative builds or no-PVP survival servers). And I found it really boring. The first person to hit is the person who wins. I'm sure if it's just super fast clicks, but people can knockback you in the air and keep you up in the air, killing you before you have a chance to hit them a second time. It isn't very fun, I've been mostly on the losing spectrum but a couple times did something like this and, at the end of the day, didn't feel like I was skilled. I just hit first. What kills I find satisfying consist of long-shot bow hits at a moving target, placing a lava bucket as an enemy charges absentmindedly at you, using ender peals e to switch up the playing field. I've been playing Star Wars Battlefront II since launch last year, and one thing I like how it are how the lightsabers parry. You can block to completely counter enemy attacks. When two competent saber users meet 1 on 1 you get a really fun, dynamic battle. It makes sense. Minecraft's shields are bulky and a complete disaster when fighting two+ people. Even when they work shields have such low durability it quickly becomes more efficient to just fight back. So I support parrying and the like. Armor weight is one of the more controversial ideas here. But I agree there should be a bit more variety. The slowness shouldn't be that much, because I still doubt people would prefer any other tier to diamond. Maybe the later-game players could switch between leather and diamond for transportation / fighting purposes via ender chest, but most will probably stay safe. The one thing I'm not a supporter of, but don't really see any problem with, is magic resistance for gold. I don't think this would ever come in handy as it has such low durability and weakness to regular damage. But it's better than nothing. I think the entire armor section could be further expanded, with maybe a few new tiers and all sets given their own unique purpose. But that may deviate from the vanilla friendly nature of this thread. I agree that the slowness shouldn't be that much. I tried not to include many numbers in the post because 1) the post wouldn't flow as smoothly, and 2) with this kind of thing you really just need to test it anyway. I think it'd be useful for fighting guardians, witches, and players that are using potions. You could maybe even have a diamond chestplate and diamond boots, and a gold helmet and gold leggings. Also keep in mind that gold now has the knockback resistance. Cooldown: support. When I read, I immediately thought of energy bars. That might be a bit much for this suggestion, but what if you had an energy bar and every time you attacked you lost an energy but it regens pretty quickly. Blocking: I like the idea but how would this work when a shield is in your offhand? Shields: Support, but what does experiencing much lower sensitivity mean (sorry for my stupidity)? I also think that arrows should stick to shields instead of bouncing off. You should be able to hit arrow with your sword to reflect them. Also, blocking with your shield shouldn't deal any knockback to the player that attacks you, Instead, the player with the shield should be knocked back. When they are knocked back, they will remain on the ground but be pushed backwards. Ho much a player is knocked back is dependant on how much damage is dealt to the player. Magic Resistance: if magic was added to armor, I feel like the same property would have to apply to tools as well. I don't think Minecraft needs that complex of a combat system. If a shield is in your offhand, then the shield would block instead of the sword. The lower sensitivity makes it so that the player using the shield cannot defend against another player or enemy attacking from the side. I agree that the attacker should not experience knockback, so I'll add that to the post. I do not agree that the person using the shield should be knocked back. // Minecraft.checkAttackSpeed() when a player attacks more than once per second. // while holding a weapon. If check is false only sets the last attack time. I also do not consider MC-4732 (the original description, not the Creative part, which is irrelevant to me anyway since I only play singleplayer) to be a bug and thus have not fixed it even though it is a one-line fix (after all, bows lose durability even if the arrow doesn't hit anything); when combined with the above changes you can lose durability extremely fast by spam-clicking (I can easily break a whole gold sword on a single zombie). The only issue I see with my system is that autoclickers can easily exploit it (fire an event the instant the cursor moves over a mob that is not damage-immune; with many mobs you could deal huge amounts of damage, but I imagine that this can easily be detected since no real player can attack multiple mobs that quickly, no matter how skillful they are; I can accurately hit 3-4 per second, which still translates to 42.75-57 DPS for a 14.25 damage sword (equivalent to Sharpness V diamond before 1.9), far in excess of the 16 DPS that you can get in 1.9+ (22.8 if Sharpness still worked like before and diamond swords added 7 damage (8 total) instead of replacing your unarmed damage). I also mainly consider gold/leather/chain armor to be in the game for mobs to wear, as they aren't considered to be that valuable so a lot of drops from them wouldn't break game balance (this may be why iron and diamond are so rare; even then, they could make them a lot more common without breaking game balance since you have to see an average of 15,551 zombies/skeletons at the maximum regional difficulty to see just one with diamond armor, which then has a low chance of dropping). I'd also never consider using anything other than diamond because nothing else is strong enough - try surviving a point-blank creeper explosion in anything less than diamond - even enchanted diamond in 1.9+ (IMO, general armor penetration was one of the worst things they could have added; TMCW instead reduces armor protection (for players only) from 4% to 3.333% per armor point, with diamond being reduced to 18 points (60% damage reduction) and being replaced with a much rarer material as the bets armor/tools (again, only for players; diamond reduces damage for mobs by 80% while amethyst armor actually gives them 22 armor points, 88% damage reduction, and swords and tools similarly add 1 more damage than players get), and reduces creeper damage from 49 to 36, but with a reduced drop-off with distance and creepers continue moving while in countdown (which used to be in vanilla until they gave them a new AI in 1.2-1.3). I do have a form of armor penetration (besides the normal sources that bypass armor) - axes, which are otherwise the same as pre-1.9, penetrate armor in the same way that 1.9's mechanic works (1 armor point for every 2 damage (0 toughness), down to a maximum of 80% penetration. For players with axes this is nerfed so 4 damage is needed (the same as full diamond in 1.9+) and maximum penetration is 60%. Efficiency also behaves just like Sharpness (+1.25 damage per level) on tools when used by mobs and zombies can spawn with iron/diamond/amethyst axes). Axes used by players are still effective enough that they take only half as many hits as a sword to kill a mob in full armor (88% damage reduction, which gives a 20 HP mob the equivalent of 166.7 health; an axe with 13.25 damage reduces this to 74.75% / 79.2 health, taking 11.7 hits (12) for a sword and 5.98 (6) for an axe). Omg I haven’t even gone through the whole suggestion and I already support this. However I do like the current sword combat.